Assoc Prof Mats’eliso ‘Mamahlape Maria Carmel Moshoeshoe-Chadzingwa graduated in 1977 at the National University of Lesotho with a B.A. plus a Concurrent Certificate in Education (B.A. + CCE). She joined the Lesotho Government civil service and became part of the team that founded the then newly-established Lesotho National Library Services (LNLS) as the British Council-funded project. Under the auspices of the British Council/LNLS project she received a two years training from the Polytechnic of North London where she obtained a Higher Diploma in Librarianship that set a solid foundation of her career. She resumed duty at LNLS where she served as Librarian. In 1983 she was engaged as a trainee Documentalist within the Documentation and Publication Division of the Institute of Southern African Studies (ISAS) of the National University of Lesotho. She acquired a Masters degree in Library and Information Studies from the University of London in 1985. She was upgraded Documentalist at ISAS on her return. Her rise from that level to Senior Documentalist and Head of the Documentation and Publication Division tallied with the pace of developing the division. She secured several external funding grants for ISAS. In 1998 she enrolled with the University of Natal, and obtained PhD in 2002. Dr. Moshoeshoe-Chadzingwa was then appointed Deputy Librarian, the second in charge of the NUL Library. From 2006 up to the present, Dr Moshoeshoe-Chadzingwa has been appointed on contract as University Librarian. She has held membership of several professional associations and societies which she served at managerial capacities. The examples are the Lesotho Library Association founded in 1980, and the International Federation of Library Associations and Institutions (IFLA) whose international standards, inter alia motivated her to coordinate a project for libraries for the visually impaired at NUL. By 2002 she co-founded the Lesotho Library Consortium (LELICO) which has since been propelling Open Access and electronic information in libraries in the country. 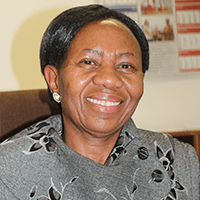 On account of her interaction with, and as serving on the Advisory Boards of the international Electronic Information for Libraries (EIFL) and Research 4Life, NUL Library users, and of those of LELICO members have mainly free access to rich databases. She is serving a second term on the Africa Section of IFLA; has served IFLA‚s Committee of Free Access to Freedom of Expression (FAIFE). She is the chair of the Communication and Information Committee of the Lesotho National Commission to UNESCO, which proposed for funding of several schemes at the community level. She has also been a part-time Lecturer of Library and Information Studies offered by NUL. Established in 1954 as the nucleus collection of the former Pius XII College, the Library moved to the current building that was constructed in 1964. The Library building was named after Thomas Mofolo when it became NUL Library. The Library has since evolved into a conglomerate of a conventional library, the archives, documentation unit, a museum section and other services that harmoniously provide information for academic and related purposes. The service operates from the Roma campus-based Thomas Mofolo Library (TML) building that is the hub and the source of a variety of information resources. Structurally, the Library functions through three Divisions whose scope permeates satellite sites at the Faculty of Law, at ISAS and at IEMS. The Library holds about 200,000 volumes of print books on the open shelves and over 189,000 titles of documentation and archival records that are kept on closed access. There are 501 titles of bound and current serial items. Electronic resources range from an increasing number of licensed databases, to several others available through subscription, exchanges and free deposits. The nucleus of the University museum is steadily developing. The entire collection of various conventional and non-conventional information-channeling formats is housed mainly at TML where the Online Public Access Catalogue (OPAC) describes and locates each of the items listed in the automated system. Although gradually being phased out, a manual catalogue for the semi-catalogued materials exists concurrently with OPAC. Subject areas of all these materials focus on the information needs of clients as they pertain to the academic programmes of NUL. As well, the expressed information needs generally reflect programmes and courses offered at NUL. The NUL Library at Roma, in Maseru and Mohale’s Hoek attracts learners as the principal clients who physically visit the service points in great numbers. B.A + Concurrent Certificate of Education (NUL) Dip. M.A. LIS (London), Ph.D. (Natal).